If you can remember the days of having your sister actually iron your hair flat, then a regular old straightener is probably a godsend to you. Technology is constantly advancing, and for us hair buffs, that means faster, better, and stronger hair irons. But with all the different styling tools out there, it’s hard to know which ones are all talk, and which ones actually mean business. Based on both consumer reviews and professional feedback, these are the top ten hair irons available on Amazon right now, so your newest hair fix won’t be a gamble. The iconic CHI brand straightener is designed by hairdressers for hairdressers, so you know you’re getting top-notch quality. With 1-inch plates, you can easily flip and twist for tight curls or loose waves, or simply straighten with precision and ease, and the swivel cord and ergonomic-grip means you can do your hair and your friends’ without getting tired. If you’ve ever over styled your hair, you’ll love the Diva flat iron: the plates are infused with Argan oil, so every time you use the straightener, you get a blast of moisture and shine that gets diffused throughout your hair thanks to the heat. Plus, with the baby pink hue, you’ll feel every bit a hair-styling diva! This luxury straightener is worth the splurge: it uses cutting-edge tri-zone technology with sensors that maintain the best styling temperature for your hair. This drastically reduces breakage and over-heating, so you can style without the guilt. The GHD styler is designed with control in mind, and it shows: the perfectly sized handle and plates give you maximum flexibility and rein over flipping, twisting, curling and straightening those pesky fly-away hairs. If you’re on a budget, you’ll find your best deal with this hair iron. It gets you silky smooth hair in minutes, thanks to a turbo boost feature that heats up the iron quickly and consistently—which is a sore spot for most straighteners. There’s nothing worse than getting halfway through your hair only to realize half the heat has been lost. This lightweight but high-voltage straightener is ideal for girls with thick or curly hair—say goodbye to running your straightener 3-4 times over your hair! The Babyliss Pro gives you satin-smooth hair on the first swipe, and with 5 different heat settings, you can really customize it to your unique hair needs. While it’s definitely a mouthful to say, this flat iron means business. It’s an affordable option and can double as curling iron, thanks to the narrow 1-inch plates. It comes with a glove and travel pouch, so you can really get down and dirty without worrying about burning three layers of skin. You’ll love the sleek, luxurious look of this flat iron; with a pretty pink hue and compact design, the Kipozi is a great addition to any gal’s bathroom. It has a smart auto-lock mechanism that keeps the plates together when not in use, it has a various settings depending on the health of your hair, and even has a clever locking setting so that you don’t keep turning the flat iron off every time you twist it. Advanced infrared technology sets this hair iron apart from the crowd; it locks in your hair’s moisture and leaves you with shiny, healthy-looking locks. Plus with the 60-minute auto shut off feature, you no longer have to dash back to your place in a panic thinking you burned the house down. Phew. If you feel like trying something a little different, the Steampod is getting rave reviews and making waves: using a pod filled with water, the styling tool uses steam rather than heat to get your hair straight and untangle knots. The steam is said to be less damaging (which can help with hair growth), and you get professional-level straight, smooth hair that can last up to three days. It’s a unique approach that salons are going crazy for, so we see this trend catching on quick. 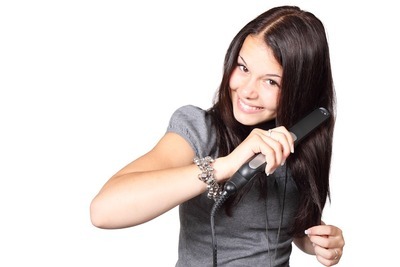 For curly gals, sometimes a regular hair iron simply isn’t sufficient. Cue the Bearmoo Brush, which straightens hair much faster and more effectively than normal flat irons. It brushes as it straightens, helping to keep the heat diffused throughout your strands for healthier, smoother hair.